Heat oil in a large saute pan over medium-high heat. Add chicken tenders and season with salt and fresh ground pepper. Cook for 2 to 3 minutes and then flip over and repeat with seasoning on the other side. Continue cooking for an additional 2 to 3 minutes until nicely browned. Pour salsa over the tenders, reduce heat to low, and simmer while you prepare the couscous. Heat oil in large skillet over medium heat until hot. Add red bell pepper, onion, jalapeno and garlic. Cook 6 minutes or until vegetables are tender, stirring occasionally. Add chicken broth and bring to a boil. Stir in couscous, 1/2 teaspoon chili powder, 1/2 teaspoon cumin, 1/2 teaspoon salt. Cover the skillet and remove from heat. Let stand 5 minutes or until broth is absorbed. Fluff couscous mixture with a fork. Stir in 1 can black beans, 1/2 cup thawed corn, and 1-1/2 cups cheese. Cover and return pan to low heat for 3 or 4 minutes, until warmed through and cheese has melted. 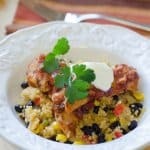 Top individual servings of couscous with salsa chicken tenders. Garnish with sour cream and cilantro.